Let’s kick start the summer – its BBQ season! The sights, sounds and smells of barbecuing no longer has to be restricted to one grill master tucked away in the corner of the garden. With the Well Done Social BBQ Grill, you can share the cooking experience from the convenience of your picnic table so everyone gets to share in the fun. Now everyone can enjoy their food as they want it cooked. Prefer your steak a little more rare to the rest of your family? Not a problem, just cook your food to your liking and let everyone else look after theirs! The Well Done Social BBQ is safe to use even on a white table cloth and has a large cooking surface that can accommodate any food items including soup bowls. The Well Done Social BBQ Grill has unique oblong shape so that it fits perfectly down the middle of the table and caters for up to six friends or members of the family. Steamer Trading are currently offering this fabulous BBQ for only £68.95 – a whopping £30 off the RRP. Your local Steamer Trading Cookshop can help with a wide range of BBQ accessories and ideas – pop along and see how you can be inspired today! 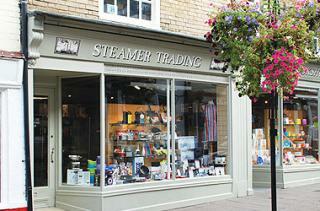 For more information, or to find your nearest Steamer Trading, please visit www.steamer.co.uk.